These executive gift sets are offered at an exceptionally low price. They include a stylish pocket business card case featuring a black PU leather cover on a metal case with a quality silver plated finish. The case opens via two leather flaps on the lid, one of which features a brushed metal plate and both of which have a magnetic seal to keep them closed. 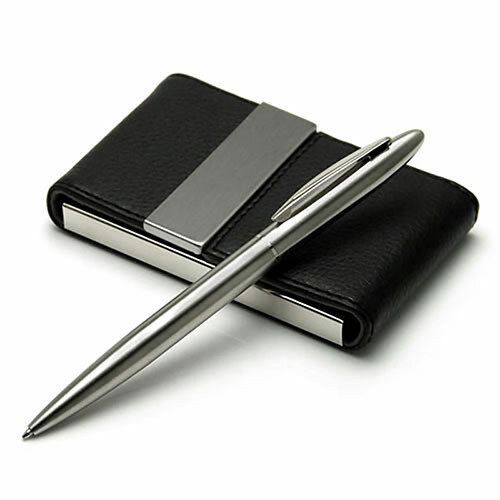 The brushed metal plate is ideal for engraving and is a match to the brushed metal finish of the ballpoint pen. These attractive, slimline pens have a twist top action to reveal a standard black ink ballpoint refill. Both items are presented in a chocolate brown cloth-covered box with felt-lined insert.